The combustion of diesel fuel produces soot particles that accumulate in the diesel particulate filter (DPF). Due to low engine speeds, short-haul and city traffic, and traffic jams, the DPF does not get hot enough to burn the soot particles. As a result, the DPF gets clogged. 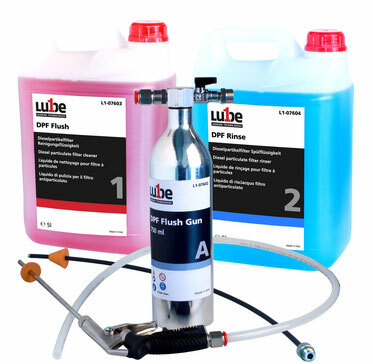 The Lube1 DPF Cleaning Starter Kit is a complete set for professional DPF cleaning. Simple - application in built-in condition. Fast - The diesel particulate filter can be cleaned quickly and effectively in the workshop. Efficient - The Lube1 DPF cleaning concept cleans the entire diesel particulate filter - not just a narrow channel is burned free. Reliable - deposits are flushed out during the flushing process and thus do not remain in the diesel particulate filter, where they can again bind carbon residues and block the filter again.